For the longest time the only thing I knew about Pink Cream 69 was that they had inadvertently supplied Helloween with vocalist Andi Deris. Somewhere along the way though (of this journey we call life) a friend supplied me a couple of their songs in the form of a compilation CD. Does anyone even make those anymore other then me? Or do kids these days just make up digital mixes for their friends? I wonder. Anyway, armed with the knowledge that I had a couple of their songs tucked away somewhere in my CD collection I tackled this album. At this point in time the band features British vocalist David Readman (Adagio, Voodoo Circle). I'm not sure who sang on the cuts I heard before as I couldn't find the CD with the songs. It very well could have been Readman singing though. Either way I've heard him before as I have a Voodoo Circle album floating around here somewhere. Readman's got the right kind of pipes for a band like Pink Cream 69. "Ceremonial" is the band's first new album in six years. Between then (2007's "In10sity") and now the band has added their former drum tech as the new drummer. Chris Schmidt (First Signal, Sunstorm, Wicked Sensation) replaced longtime Pink Cream 69 drummer Kosta Zafiriouto. His style fits right in and, along with Readman, guitarists Alfred Koffler & Uwe Reitenauer and bassist Dennis Ward, Pink Cream 69 sounds all around sharp. 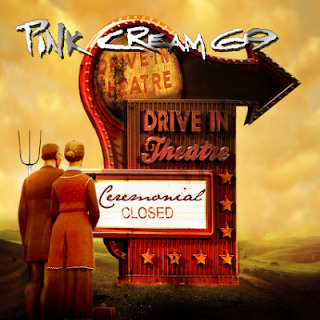 With Pink Cream 69 (such a "interesting" moniker) the name of the game is melodic hard rock. The band members might be from all over the world (Schmidt, Alfred and Uwe hail from Germany, David is British and Dennis is from right here in the U.S.), but their style is clearly structured to sound like American hard rock. Or at least this album is. "Ceremonial" starts off on the right foot with "Land Of Confusion". No, this is not a Genesis cover. Instead it's high-energy rocker that gives you high hopes for what will follow. Along with the next cut, "Wasted Years", this album offered a lot of promise.Unfortunately that was as good as it gets. Track number three, "Special", is anything but special. It's horribly bland rock. From there the album continued to lose steam as if it gave up on itself. How you can have a song called "I Came To Rock" end up sounding like the least inspiring rock song of all time is lost on me. A couple of numbers were better then others, but "Land Of Confusion" and "Wasted Years" seem to have been put up front to entice and entrap the listener. By the time "Superman" came to a close my brain hurt. I was tired from trying to decide if Pink Cream 69 were seriously that out of focus with reality or if they secretly did want to be a second generation version of Nickleback? That doesn't say much does it?